But all of our taco experience was thrown out the window when I made lime crema. I first made lime crema while we were on vacation with extended family over the week of Thanksgiving. Each family picked one night to cook dinner and what they wanted to make. I picked Wednesday and (naturally) chose tacos. I was cooking for 15 people, so this was a good bit of chopping, but the lime crema came together in less than 5 minutes… and it STOLE the show! Hands down, the lime crema MADE the tacos. Yes, the shredded pork was amazing. Yes, salsa verde gives a good swift kick of flavor and heat. Yes, a squeeze of lime juice brightens the flavors. But the lime crema?! Oh my. Friends, if you haven’t tried lime crema before, you have been missing one heck of a flavor bombshell! It’s crazy to think that something so good can come from just FOUR ingredients, but prepare your mind to be blown because that’s exactly what happens when you put lime crema on your tacos. Already magical and delicious in its own right, sour cream is the base for this recipe. I use full-fat since a traditional real food diet includes lots of healthy fats, but you can use a lower-fat variety if you wish. I will say this – if you already like sour cream (like we do), get a 16oz tub because you’ll want to put this stuff on EVERYTHING. You probably could have guessed this based on the name of the recipe, but we’re using the real thing here instead of lime juice. Why? Because we’re using the WHOLE thing – we’re zesting it AND juicing it. 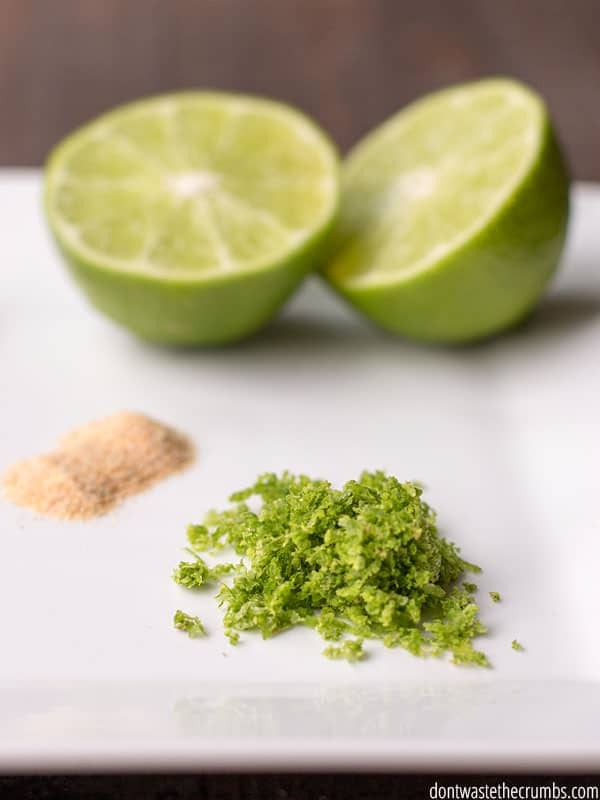 The zest of a lime is the green part only of the peel on the outside. I used the medium holes in my old-school cheese grater (mine is similar to this one) to zest because I don’t have a microplane (although I have my eyes on this one!). In the rental house at Thanksgiving, I used a sharp knife and carefully cut the zest off and then ran my knife over the peel until it was very finely diced. Use what you have to make it work! I also have an old school juicer, like this one except mine is white. For the best results, cut a lime in half (around the fat middle) instead of wedges when you’re juicing the lime. The only parts we are NOT using are the pith (the white part of the peel) and the endocarp (the white part that holds the flesh of the lime into segments). 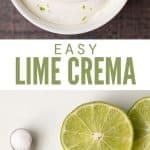 Both the pith and endocarp are bitter and will ruin your lime crema, so avoid them. This means NOT sticking the lime into the blender and hitting go – all the bitter parts will be mixed up with the tasty parts and your lime crema won’t taste nearly as good. This isn’t the first ingredient to come to mind when I think of lime crema, but just a small amount really makes the cream shine. 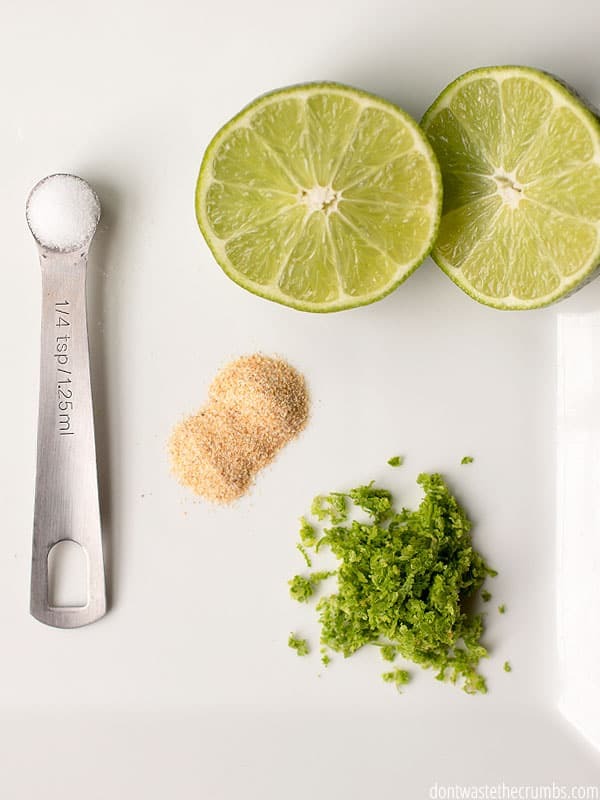 The mac daddy of all seasonings, lime crema must have salt. If you skip it and you wonder why your lime crema doesn’t taste that good, it’s because it needs salt. 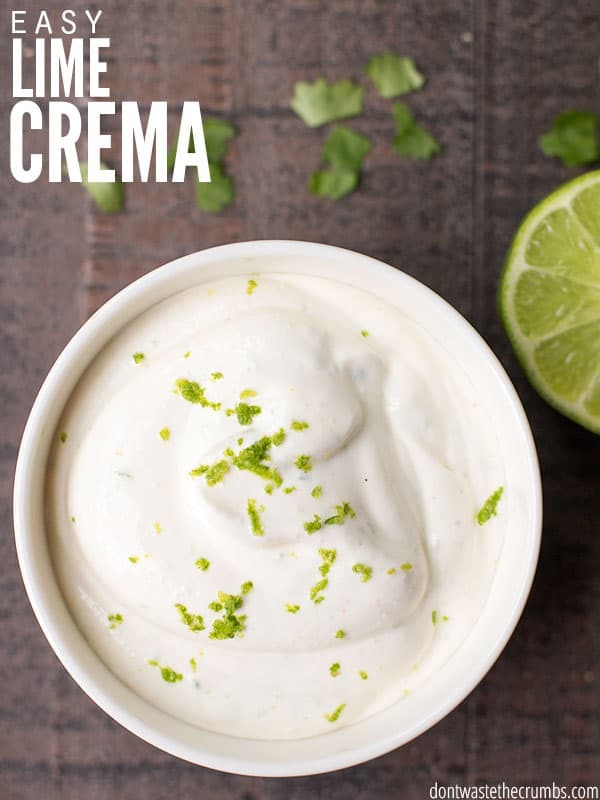 Lime crema is now a must-have when I make tacos… which means I also use it on taco bowls and taco salads as-is. Plus I’m all about making something once and using it in several different ways. 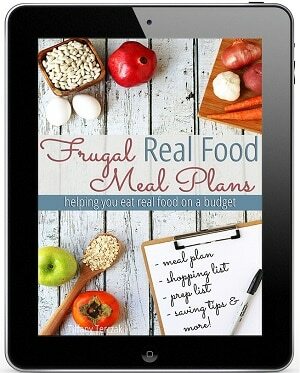 It’s one of my tips in my 5 Day Challenge to Getting Dinner on the Table FAST! 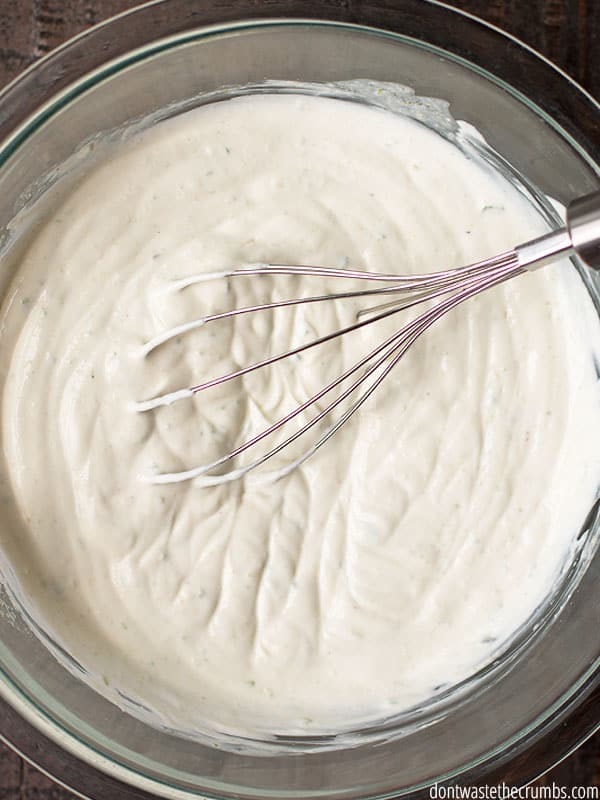 Remember that sour cream alone has a decent shelf life, and adding the lime juice helps extend it a bit more. I’ve kept this in the fridge for two weeks without issue! Empty sour cream into a small bowl and set aside. Roll the limes on counter for about a minute each to loosen up the juices. Zest both limes, ensuring you are ONLY getting the green part of the peel and not the white part. Cut the limes through the middle and using a juicer, get all the juice out. Add all the zest, juice, granulated garlic and salt to the sour cream and whisk well to combine. Place in the refrigerator until it's time to serve. Note that letting the lime crema sit for at least 4 hours helps the flavors to meld together better, but you can enjoy it right away too. Store leftover lime crema in the original sour cream container and label it! 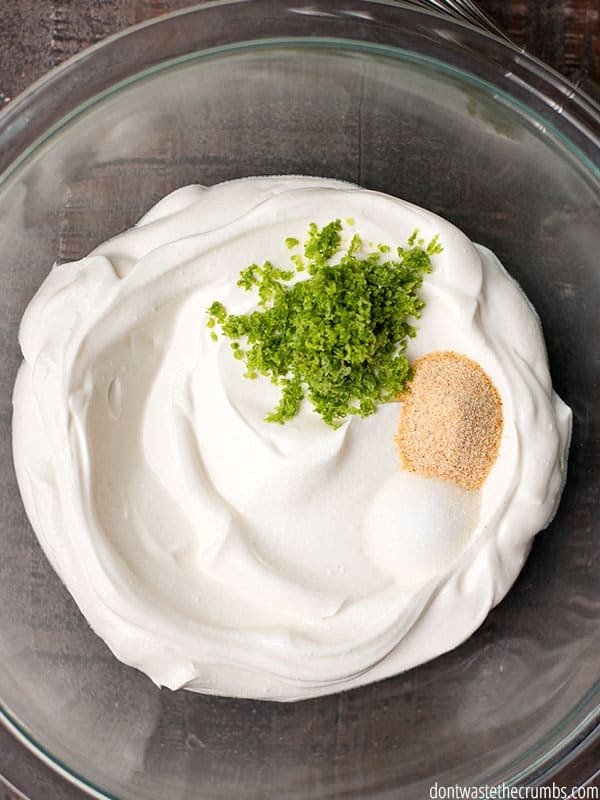 The fresh lime is what truly makes this lime crema stand above any other taco toppings. Don’t skimp on the zest. Use this cheese grater or this microplane for the best zest. Does your family like tacos as much as we do? What do you like to serve them with? Share your ideas in the comments below! Btw, I made your carnitas the other day and they were fantastic. Then I took the leftovers to church where there was a surprise potluck with a lot of hispanic friends, and they devoured the leftover carnita meat! I figure if the hispanics like it, it’s a winner for good reason 🙂 Thanks again for sharing the recipe! You’re so welcome Diana! And I thought the same thing about the citrus juice and sour cream, but nope! You’re golden for a least a week. 😉 Wonderful news that the carnitas were devoured at the potluck! Glad it’s a winner!! Using green onion instead of white onion adds nice color to the dip. I also like to use fresh garlic chives…you get the garlic flavor without all that garlic breath. Adding some finely minced jalapenos or serranos is a great way to add some heat. This dip is so versatile and easy to personalize. Thanks for this!!!! It might be a bit more tangy Leigh, but it should still be pretty tasty! This sounds yummy. I can’t eat dairy and don’t like the “fake” sour creams so I think I will try this with mayonnaise. I make your mayo all.the.time. My 16-year-old daughter, who loves to cook, mixed this up the night you posted it to go on our tamales and nachos (it was “Mexican Monday” at our house). The kids devoured everything with the lime crema on it! 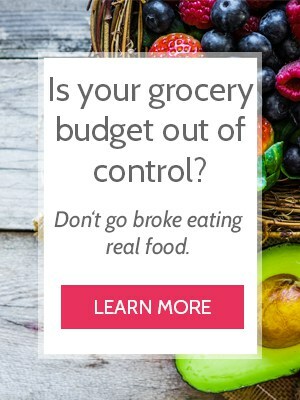 My husband was the only one who didn’t care for it – but that’s because he doesn’t like anything with citrus on his food. : ) Thanks so much for the recipe – it’s a new favorite. 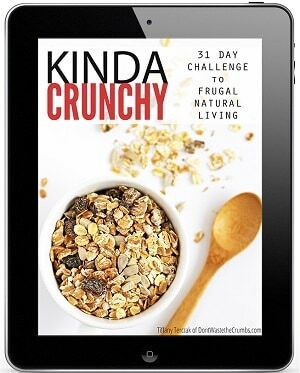 It’ll join our homemade recipe books with so many other recipes from your blog! 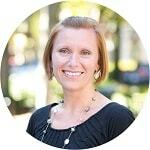 I’ve been reading your blog for a while but have never posted. I tried this last week – I tossed it with shredded cabbage to go on top of fish tacos – absolutely delicious!!! I made it with plain yogurt instead of sour cream since that’s what I had. Total hit with my family! Tiffany, we’re having it again tonight on Mexican Monday – this time on veggie quesadillas. The kids have BEGGED for the lime crema again. Thanks!!! Oh man, you’re welcome! What a great response from the kids! Do you happen to have any nutritional information for this recipe? 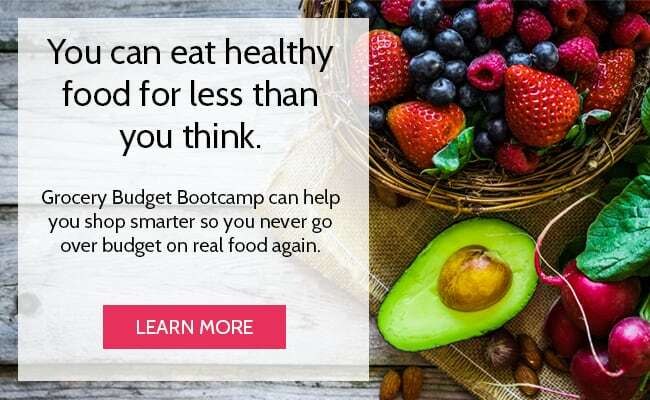 How much is a serving and how many calories? Thank you! 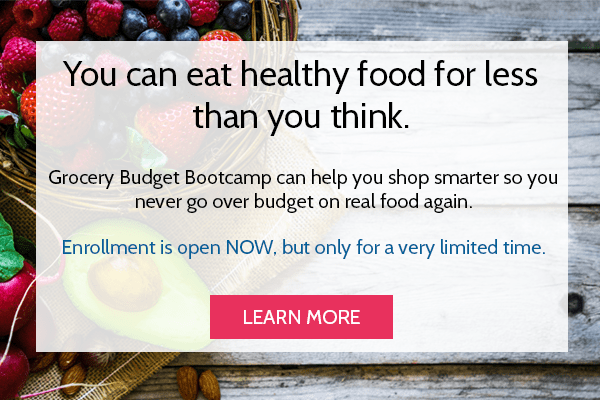 I don’t Abby, but you can enter it into any nutritional calculator! I’m confused by this instruction of deconstructing to lime. Aren’t the zest and peel the same thing? And “running a knife over” doesn’t sound like the act of dicing? Sound slime an act of skinning something. Can you please clarify? Anthony – the zest and the peel are not the same thing. The zest is the colored part, so for a lime, it’s just the green. The white part is the pithe, which is very bitter. I carefully cut off just the green portion, and then minced the zest until it was teeny tiny. Hope that clarifies! Yas! Making carnitas tacos for dinner tonight and wanted to add a notch of flavor. This is so simple and fresh. I tasted it and its amazing! I cannot wait to try it tonight, after the flavors have marinated, on my tacos. Yum!! Hope you love it as much as we do Amber! I came upon your site today. I (we)are so happy that I did. I made this today for our tacos. Hubby and I really enjoy this easy and tasty recipe on our tacos. I’m so glad you liked the lime crema Tammy!! So glad you liked this Chelsea!